I am starting a little series of posts for the discussion of products for our dogs. The idea is to have a broader understanding of the equipment, its use, origin, and ups and downs. From time to time (I can't commit to a set schedule. ), I will post an item and ask for comments. When's the best time, or what situations would you use it? Where's the best place to get it? For this first post, I am asking about the agitation collar. Additionally, I would like to know whether it's better with or without the handle. Used mostly for building drive in protection work. I have one but I much prefer to use the agitation harness, less stress on the throat. If you are going to use the collar - the handle is a definite plus. It gives you much better leverage than just the leash. I wouldn't use or buy the collar pictured though. Mine has a handle but it is also padded. I wondering if we can clarify its name. Patty said that it used build drive for protection work. From my point of view, it looks like something that would provide the handler more control (and the dog more comfort) when it is amped up and ready to pounce (agitated). Is this a wrong assumption? Does anyone know how long they've been around? I have never seen it used on the street, I have only seen it used when building drive for protection. It is made 3" wide to make it less harmful when the dog is pulling hard to get at the decoy who is agitating him, hence the name agitation collar. I used one early on in our training but I felt like it was still uncomfortable on ICE so I switched to the harness. I picked one up for general use with Endeavor. We use a 2.5"wide model with a handle from Ray Allen. En is only fifty pounds, and the handle is very hard to get a hold of because of the curvature of her neck. I chose the collar because I figured it would be less stress on her while on a leash weather she's tracking or just general daily life. The Cobra Buckle is a dream. If I get one for my Shiloh, the handle will be great use. Heh...thinking back, I sure wish I had these when I had sled dogs. They're so much easier to handle when they're in "two wheel drive". With regard to their overall employment, I think they're mainly utilitarian. I don't believe there are any commercially available sequin encrusted ones. The protection class I sat in on a year ago all had basic wide collars. A few of the dogs were harness just to get a hand hold. Bunch of positives. The only negatives with the one En has is that the buckle can punch her hair, and it was too large for her. If you're able to cut some Velcro loose and re stitch it, it's great! Endeavor doesn't seem to notice the hair pinching. It's quick and easy to get her ready to go. There are a few versions of the agitation collar. The basic idea is that with a wide collar, you are dispersing the force the dog is experiencing when pulling across its neck to make it more comfortable. They are generally 2-3 inches wide and come in leather, biothane, or nylon. The edges of the collar are important. Rounded edges mean there's less chance of the dog accidentally choking itself on a bite and outing premature; also less pressure is applied to the neck when outing the dog. The sharper or more square the edge, the more pressure applied when using the collar to out the dog, and the harder it is for the dog to ignore. Usually leather and biothane are rounded and nylon is square edges. The reasoning behind this is simply because there's different dogs and stronger drives. 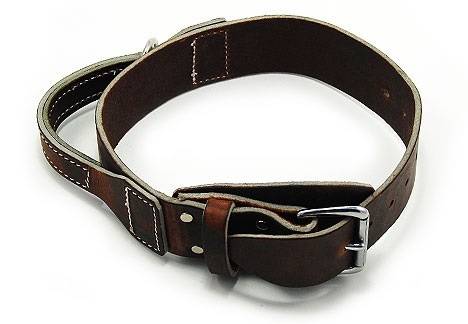 Agitation collars are used in bite work or LEK9s for control. You can control the head better, which is good for teaching the dog where to bite and bite mechanics. Some departments use ID collars as agitation collars and others will use just a prong. Either can work as long as the dog is exposed to it and trained in it and will work in it. Usually puppies are put in harnesses to build drive and protect the neck. As they get older, they are put until collars for control and to help them learn. It isn't necessary. But it's helpful depending on the dog. Larger breeds can also use the collars as regular collars, due to their size and strength. Also the handle is more user preference than anything else. For LE they will hold the Dog's collar as they remove the lead and release the dog that way. Some find holding the handle easier than grabbing the D-ring or collar itself. As another member mentioned, it is also easier to lift the dog when outing. It's important to note that agitation collars are part of the drive building tool kit. They do not harm the dog when the dog pulls, so there's no negative impact. It can build its drive without experiencing pain that may dampen it. The agitation or drive comes from the decoy (not the collar itself). 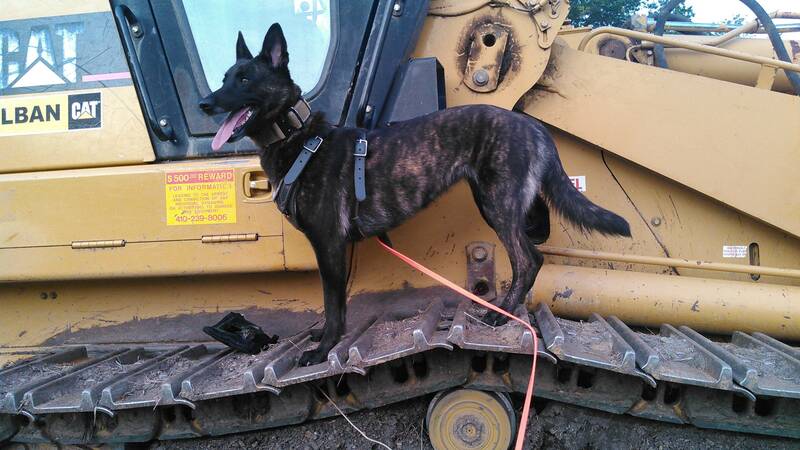 The collar can also be part of equipment cues for dual-purpose dogs in law enforcement work. Asia has a problem with her throat because the previous owners used an agitation/wide flat collar when doing bite work instead of harness. I don't use them because of this.